Standing on a cliff in Durres, Albania overlooking the Adriatic Sea, I was lost in thought, picturing the ancient relics buried along the shoreline when I was jarred from my daydreaming by the familiar alarm of a reverse-alert beeping beneath the cliff. Looking for the source, I spotted a dump truck below, ditching a payload of sand on to the trash-strewn beach. Four resort workers with shovels stood waiting to dole out the sand and bury the trash out of sight. First settled in 627 B.C, digging anywhere in Durres was likely to unearth daily life artifacts from the Ancient Greeks and Romans. Today, folks digging here will find Doritos bags and Nestle’s plastic bottles, legacies of the 21st century. “Out of sight, out of mind” is the credo for trash. A modern phenomenon, garbage as we know it wasn’t really a thing until 1950. Before then large manufacturers, like Nabisco, used beautiful, reusable receptacles. Now, single-use items carry a deceptive air of convenience. We are the first humans ever to consider a product’s disposability a virtue, but at what cost? Lifecycle estimates for plastic’s worst offenders range from over 400 years to 1,000 years or more. That’s a long time for a folly to kick around. Months later, I was in Siem Reap, Cambodia. February’s rice paddies have a green so vibrant it can seem artificial amid a landscape dotted with banana trees and towering, swaying palms. There’s a lazy bliss in rumbling down the rural streets of Cambodia, shaded in the back of a rickety tuk-tuk as the tropical swelter grows heavy in the afternoon. But the bliss was vexed by garbage piles on every roadway and waterways literally clogged with plastic containers and disposable packages. The Siem Reap River, like most rivers, doesn’t flow straight. It twists and turn in serpentine ways, and where those tight bends happen, buoyant water bottles and other floating plastic containers congregate in masses. Narrow canals pile up and can become blocked. Bushes become receptacles for trash as people cram their wrappers into thickets. 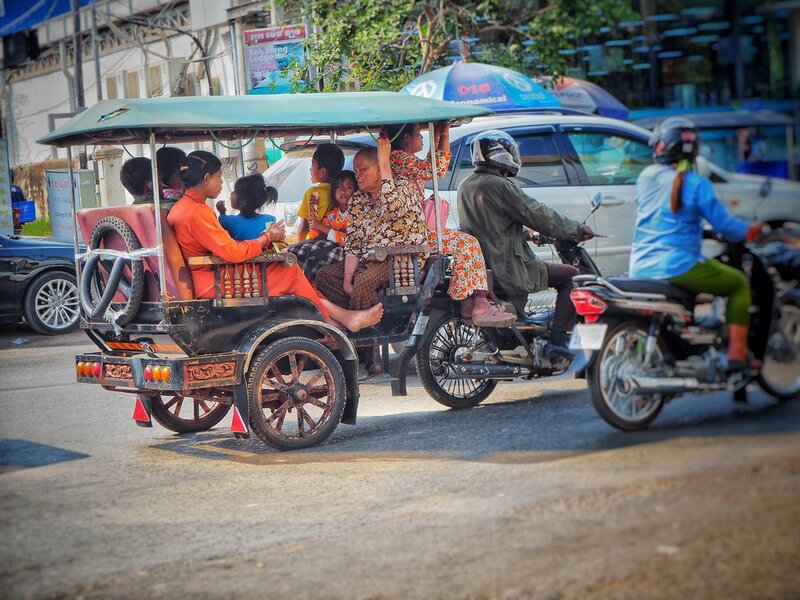 Like all tourist spots, most visitors in Siem Reap see or do the same things. Angkor Wat, the ancient Khmer Empire temple site, considered the world’s largest holy site (you might recognize it from Angelina Jolie’s “Tomb Raider”), is a given. 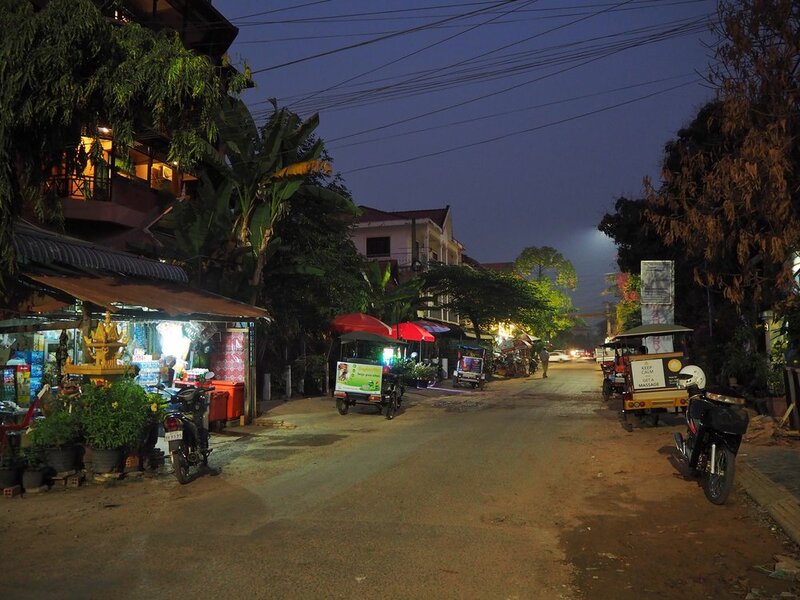 So is a stroll along River Road, which cuts through the heart of Siem Reap’s local business and tourist areas, before lunching somewhere amid the picturesque old town area’s endless narrow lanes, shops, and eateries. That predictability is lucky for any tourism-heavy city, since it’s akin to welcoming guests to your home; you can make the place presentable by cramming your mess into closets. For those who stay longer in Siem Reap and venture beyond the touristy areas, they see the plastic skeletons in that closet firsthand. The main stretch of River Road is lovely, where the tourist lodgings are largely found and there’s little trash in the river. Leave the tourist quarter, though, and garbage abounds. And it’s largely a generational problem. Just 25 years ago, takeout or street food in the area came on paper or a banana leaf. Today, it’s plastic and Styrofoam. Almost like people who let themselves go, the decline happens steadily, not dramatically. Then one day comes the reckoning—wondering of how it all got so bad, so fast. 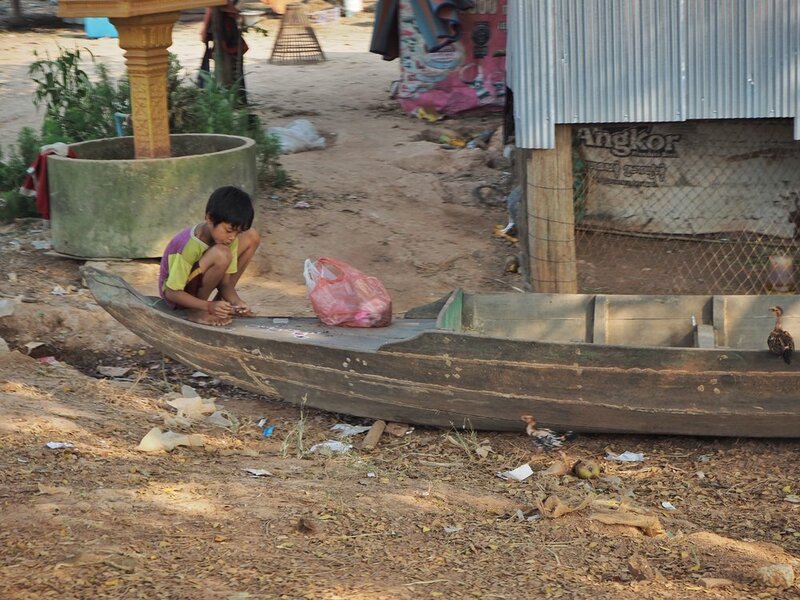 So too with Siem Reap, where locals are beginning to feel the urgency for change. Water refill stations are springing up alongside awareness efforts to make both locals and tourists rethink the trash they generate. Metal water containers sold by Refill Cambodia partners have the “Refill Not Landfill” slogan stamped on them, along with a list of businesses involved with providing free or affordable water refills in the city. And from bamboo straws to woven bags, there are now options for those who wish to embrace them. For a month, Siem Reap’s Babel Guest House was my home. Its owners, Norwegians Katrine Solhaug and Simen Julner, have made being plastic-free a life’s mission. 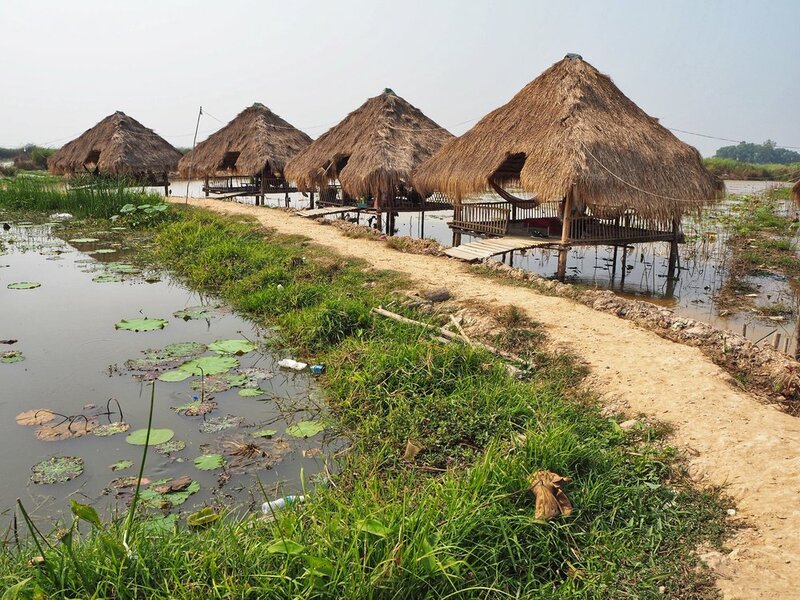 Recently named one of Cambodia’s top 25 eco-lodgings, the young parents dream of upending our plastic-based world, giving their children a better future. That Albanian cliff was my plastic tipping point. I asked Katrine to tell me about hers. “I saw a chicken eating plastic in the countryside. That was when I realized that we are actually eating plastic. Plastic is really everywhere; in the sea but also on land, in the animals that we eat! And in the very soil where we grow our vegetables,” she says. Katrine’s chicken epiphany is reflective of what scientists are discovering on a larger scale. Plastic nanoparticles are omnipresent, especially in the ocean, officially making plastic part of the food chain. Recycling is a misnomer; plastic can only be recycled a few times, and it’s estimated that, globally, only about 9 percent is. Of that which is, much is now made into clothing. That fleece dryer fluff? It too can be plastic, blowing on the wind. Since we ditched the beautiful, reusable receptacles for faster and flashier plastic in the 1950s, the industry has pumped out 7.8 billion metric tons of plastic. Of that, more than half was manufactured since 2004. At the 2019 World Economic Forum of Davos, the heads of Coke and Pepsi pledged to dramatically reduce plastics pollution by 2030. Good thing, too, because reports are that Coke, Pepsi and Nestle are the world’s leading plastics perpetrators. But the greatest trick ever played was the industry painting consumers as the irresponsible source of litter and trash. In 1953, the American Can Company, backed by others like Coca-Cola, came up with its “Keep America Beautiful” campaign, passing responsibility to consumers for keeping the environment orderly. They even added a new word to our lexicon, the “litterbug.” Cue people as villains, not packaging manufacturers. Consumers didn’t create trash. We didn’t phase out glass bottles for soda. Yet the world pays for that which industry profits from. We’re sold beverages under the guise of believing we can recycle the plastic bottles, but it’s smoke and mirrors. When consumers can only choose between plastic and plastic, how can we take the environmental high road? Whether standing on an Albanian cliff, or tuk-tuking through the Cambodian countryside, trash has been omnipresent in my travels. It’s inescapable everywhere, but some countries have big enough houses and deep enough wallets to hide it. This is no longer about consumer ethos and buyer behavior, it’s about industry forcing us into a world without a plastic-free choice. Industry is cognizant of growing anger and fears about our trash-covered planet. In 2019, BASF—the world’s largest chemical company—co-founded the “Alliance to End Plastic Waste,” initiative, which purports to implement dramatic improvements on the plastics front by 2030. The trouble is, the group is comprised of those who profit from plastic, like oil and gas companies. But perhaps it’s now more feasible for them to go green. After all, more than 66 percent of consumers in 60 countries claim they would pay more for sustainable packaging. But what’s the “or else” with this pledge to end plastic waste? Who, or what, will have oversight? If these brands don’t achieve their goals, what price will they pay? “Oops, we’ll sort it out soon” isn’t adequate anymore. Our tipping point is here. The time for opt-in awareness is long past. And is simply changing practices even enough now? In the “you break it, you buy it” world of retail, shouldn’t companies pay for the privilege of profiting and then leaving their plastic-emblazoned brands around the globe? From Albania to Cambodia, bottles of Coke and bags of Doritos litter countries lacking the budgets required to create appropriate trash-handling infrastructure. And that won’t be changing any time soon, either, when the average person’s monthly income is $585 USD in Albania and $340 USD in Cambodia. Shouldn’t foreign corporations creating trash be on the hook for its collection and processing, too? Where industry won’t, independents will. A rise of socially aware innovators and small businesses are stepping in to finally give us plastic-free choices. Whether it’s plastic-free holiday lodgings provided by folks like Simen and Katrine, or choosing glass bottles or refillable containers, a growing awareness is providing a glimmer of hope and the possibility of alternatives. But, it’s like the experts say—if your water faucet was flooding your kitchen, would you clean up the water first, or shut off the tap? We’re trying to clean up a flood that’s still flowing, and we need to stop the source. No plastic is good plastic and recycling is not enough. With a lack of international oversight, the only incentive for industry to end its reliance on plastic is for us to choose those alternatives. The premium we pay for making a more earth-friendly choice is far higher than the cost of plastic’s legacy. Steffani Cameron is a freelance writer originally from Vancouver, Canada. She has been travelling as a nomad through 25 countries since 2015. Her greatest experience was being the only visitor at a Roman Colosseum in Pula, Croatia, where she did a gladiator yell, but her favorite country was Greece. She has bylines in Washington Post, Culture, Yahoo! and others. An avid foodie and photographer, she will soon be relocating to Ottawa, Canada.